View of the Sheds of Clontarf in Ireland. 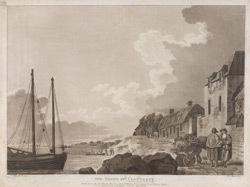 In the 18th century Clontarf was a small and isolated village situated on the east coast of Ireland. The name, which translates as the Plain of the Bull, derives from the rumbling noise which was made by the sea as it rolled over the sandbanks in Dublin Bay. Fishing was the major activity for the local population and sheds were built at the foot of Vernon Avenue as a site for curing and drying the fresh fish. The area became known as ‘the sheds’.